This tool fills the selected area with a gradient blend of the foreground and background colors by default, but there are many options. To make a blend, drag the cursor in the direction you want the gradient to go and you release the mouse button when you feel you have the right position and size of your blend. The softness of the blend depends on how far you drag the cursor. The shorter the drag distance, the sharper it will be. There are an astonishing number of things you can do with this tool, and the possibilities may seem a bit overwhelming at first. The two most important options you have are the Gradient and the Shape. 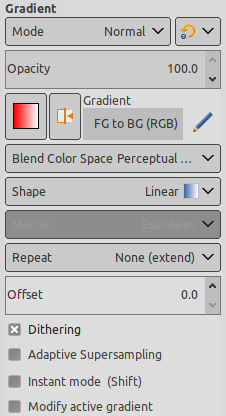 Clicking the Gradient button in the tool options brings up a Gradient Select window, allowing you to choose from among a variety of gradients supplied with GIMP; you can also construct and save custom gradients. Further information about gradients can be found in Section 10, “Gradients” and Section 3.4, “Gradients Dialog”. For Shape, there are 11 options: Linear, Bilinear, Radial, Square, Conical (symmetric), Conical (asymmetric), Shaped (angular), Shaped (spherical), Shaped (dimpled), Spiral (clockwise), and Spiral (counterclockwise); these are described in detail below. The Shaped options are the most interesting: they cause the gradient to follow the shape of the selection boundary, no matter how twisty it is. Unlike the other shapes, Shaped gradients are not affected by the length or direction of the line you draw: for them as well as every other type of gradient you are required to click inside the selection and move the mouse, but a Shaped appears the same no matter where you click or how you move. Check out the Difference option in the Mode menu, where doing the same thing (even with full opacity) will result in fantastic swirling patterns, changing and adding every time you drag the cursor. From the image-menu: Tools → Paint Tools → Blend. By clicking on the L keyboard shortcut. The GIMP provides 11 shapes, which can be selected from the drop-down list. Details on each of the shapes are given below. This gradient begins with the foreground color at the starting point of the drawn line and transitions linearly to the background color at the ending point. This shape proceeds in both directions from the starting point, for a distance determined by the length of the drawn line. It is useful, for example, for giving the appearance of a cylinder. This gradient gives a circle, with foreground color at the center and background color outside the circle. It gives the appearance of a sphere without directional lighting. There are four shapes that are some variant on a square: Square, Shaped (angular), Shaped (spherical), and Shaped (dimpled). They all put the foreground color at the center of a square, whose center is at the start of the drawn line, and whose half-diagonal is the length of the drawn line. The four options provide a variety in the manner in which the gradient is calculated; experimentation is the best means of seeing the differences. The Conical (symmetrical) shape gives the sensation of looking down at the tip of a cone, which appears to be illuminated with the background color from a direction determined by the direction of the drawn line. The Spiral shape provide spirals whose repeat width is determined by the length of the drawn line. This a more sophisticated means of smoothing the "jagged" effect of a sharp transition of color along a slanted or curved line. Only tests can allow you to choose. The Offset value permits to increase the “slope” of the gradient. It determines how far from the clicked starting point the gradient will begin. Shaped forms are not affected by this option. When this option is checked, blend tool works as in GIMP-2.8 : the gradient line disappears as soon as you release the mouse button. The option must be activated (with Shift also) before starting drawing gradient. When this option is checked, blend tool works as in GIMP-2.8 : the custom gradient is not created automatically and must be created manually. The option can be activated before starting drawing gradient or if the active gradient is not the custom gradient. Ctrl is used to create straight lines that are constrained to 15 degree absolute angles. The Gradient Editor still exists: Section 3.4.3, “The Gradient Editor”.